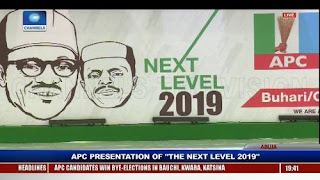 Critical Times News : Buhari’s ‘Next Level’ to where? Buhari’s ‘Next Level’ to where? Frankly speaking, I do not want to be drawn to the conclusion that the APC as a party does not have persons who could be great thinkers and strategists to be able to engage in rigorous thought process to get the right message to an already downcast audience in an election year. As a former member of the communication and media committee at the Progressive Governors’ Forum, it was a routine for select people to engage in serious discourse with the aim of churning out workable recommendations to address the myriad of problems bedevilling us as a country. I want to believe there are still openings to engage in such robust discourse except that there are too many uncoordinated scenarios in APC to the extent that crucifies synergy and intellect. This latest campaign slogan of “to the next level” is as drab as grossly a product of unthinking minds. But it serves them right. The more mistakes they make, the better for the opposition so that they can collectively edge out this under-performing government that has brought poverty, liquidation, deprivation, austerity, and hunger to bear on a populace that appears generously hopeless and rudderless. When the APC talks about change in 2015 as a campaign slogan, it was the needed sparkle to get countrymen and women thinking about doing things differently. The change mantra resonated with aplomb and ceremony that everyone was looking forward to a paradigm shift in the art of governance and service delivery. “Change” became a sing-song, an adorable cliché that signposted hope and enthusiasm. It fired our imagination and heightened our expectations. It set a tone for a robust engagement and mutual relationship that would create opportunity for us all to get our country going. Three years into government, change as a mantra, has simply gone sour, tasteless, spineless and utterly mindless. Rather than retool the thinking and the addictive properties of change to make it more sellable, APC situation room thinkers decided to come up with an overkill of a cliché or slogan or call it anything. The ‘next level’ is to me and to all intents and purposes a poor copy and a great insult to our collective psyche. Nations aspire to the next level when they have gotten it right at the foundation level. The last three and a half years have been sordid tale of leadership atrophy and absurdity, grossly bereft of ideas, utterly benumbed and overwhelmed by plethora of problems both inherited and self-made, and one that has shown visible signs of being incompetent to really help us lay a solid foundation. The other day, President Buhari launched what he called “Buhari Unity Band”, in furtherance of personalising governance as a Buhari thing, rather than being a Nigerian thing. Knowing full well that President Buhari has not shown remarkable effort at building national consensus and cohesion, making him the centrepiece of a unity band is as good as seeing Nigeria from his selfish perspective. What is wrong if Buhari decides to launch Nigeria Unity Band and make it a permanent feature of our civic responsibility to promote peace and unity. What happens to this body, if President Buhari is no longer the President? Disband? We need to drum it loud and clear to the president that Nigeria is seriously in a state of socio-economic and political catastrophe, a state of anomie that creates fertile ground for all manner of impossibilities. A state that creates insecurity. A state of deprivation with hunger and poverty as two distinct items on the menu of our collective mission. When the APC says it is taking Nigeria to the next level, it is just telling us that “Change” no longer occupies its consciousness. The people have been deceitfully scammed using change as a mantra that ushered the party into the inner sanctrum of Aso Rock pantheon. Having attained a certain level of hunger, incompetence, deprivations, poverty, and infrastructural decay, the APC is telling us it desires to take us to the next level of such debilitating realities that have rendered us prostrate. Tufiakwa! Next level of poverty. Next level of insecurity. Next level of corruption. Next level of deprivations. Next level of insurgency. Next level of poor economy. Next level of leadership inertia. Next level of incompetence. Next level of mass unemployment. Next level of mass loss of jobs, at a time that over nine million jobs have already been lost. Next level of policy flip-flop. Next level of uncoordinated presidency. Next level of search for WASC certificate. Next level of contradictions, pretensions and hypocrisy. Next level of nepotism, cronyism, selective amnesia and “paddy-paddy” government. What exactly was the APC trying to achieve with those mouth-watering promises that are hardly respected and fulfilled? What happened to the previous promises in 2015 when it promised to make Nigeria an Eldorado of some sort, but ended up making it the poverty headquarters of the world? Why does the APC always take Nigerians for fools that cannot rationalise between good and bad? What has APC done that appears so remarkable to warrant a re-election of the present crop of incompetent leaders and their army of cronies and bootlickers? What has become so tellingly distinctive in the last three years that one can easily point at? Is it the bad roads or the decayed infrastructure? Is it the poor health facilities or the absence of jobs for the teeming youths? What is the cheering news? They told us about anti-corruption but recent revelations, accusations and counter-accusations over shady and corrupt deals have exposed the rotten underbelly of a pretentious government that carries anti-corruption as its moral badge. President Buhari, easily carried away by any suggestion that tends to further his re-election project, may not know the implication of this campaign slogan. All of a sudden, APC has realised that the word “change” has become a poisoned chalice in the eyes and mouths of Nigerians. The opposition came up with change the change, and now APC lazily came up with the ‘next level’ of only God knows what. Doesn’t it bother the President that under him Nigerians have become poorer? Does he worry about the biting impact of hunger? Is he aware of malnourishment of the occupants of IDP camps across troubled states in the country? Is he aware that about 88 million Nigerians are feeding below $1 per day? Does he realise that his government has crippled many businesses and quite a number of people are exiting the country because of worsening insecurity? We all cannot be wrong. Foreign governments have spoken about the economic crisis in the land and how government policies have badly affected their fortunes. Foreign investments in Nigeria are struggling to remain afloat while domestic investment have continued to suffer from policy summersault. Our road infrastructures are nothing to write home about while opportunities for job creation have remained as sickening as a nation with clear signs of failures. Insecurity has become our second nature as killings do not marvel us any longer. In fact, if a day passes without record of killings, that day is counted as a bonus. Life has become so cheap in Nigeria that we are almost getting to a helpless situation. How can any reasonable government preside over a government that celebrates job losses as if it is a testimony of its anti-corruption fight? Rather than celebrate as a function of our collective sufferance, the Buhari administration is celebrating poverty and austerity as benchmarks of his achievements. Why should such become a selling point in the real sense of the word? What are the measured achievements of this government that are propelling it to aspire to seek a fresh mandate? Nigerians are worse off in the last three years as a result of the thoughtlessness of a government that sees itself as the Holy man, while others are Satans. A government that rotates on the same axis, choose its own friends and enemies, and allows a few individuals to call the shots at the expense of all. This government is not only a killer of initiative and creativity, it is a proprietor of under-development and dis-investment. Rather than attract foreign investment and encourage her citizens to look inwards, the president told a helpless citizenry that anyone who wants to seek greener pasture elsewhere was free to do so. The number of applicants seeking for visas in embassies of foreign countries is appalling. It easily reminds us all that something is surely wrong with our system. Corruption is digging deep into the mould while unemployment has broken new records in our annals of history. Yet, the APC will tell us they are moving to the next level. What level are we currently? Level of poverty and hunger. Level of kwashiorkor and deprivations. It is appalling to note that we have gotten to a stage in life where bizarre realities are fast becoming the available standard.